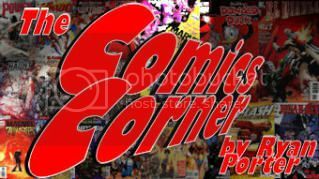 Ryan Porter is back with his unique take on Adventure Comics #4, Amazing Spider-Man #612, Dark Avengers #11, Dark Reign: The List Amazing Spider-Man One Shot, Flash: Rebirth #5, and Star Trek: The Next Generation - Ghosts #1! Come inside and see what made the top of the stack! The DC Universe is a new and exciting place for me. Outside of Batman, I’ve never really been too interested in anything in the DCU during my time as a comic book fan. But lately, Geoff Johns is making damn sure that I spend as much time in the DCU as possible. And judging by the sales figures for the month of October, I’m not the only one he’s reeled in. And as impressive as Blackest Night continues to be, he’s really got me going with Flash Rebirth. 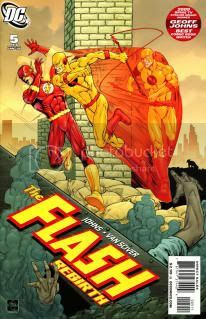 Reading this issue makes me wish I’d always read The Flash. I also wish Flash could always be drawn by Ethan Van Sciver. His pencils are amazingly detailed, each time you look at a page you can pick out new details. And his ability to capture the motion of Flash and the supporting cast is mesmerizing. I may not have always been a fan of the Flash, but thanks to Johns and Van Sciver, I am now. Comic Reviews are sponsered by Killen's! Click on any cover to go to the store and buy that issue! Another week, another comic bought just to get my hands on one of those Lantern Corps rings. This issue was too confusing for a DCU newbie such as myself. 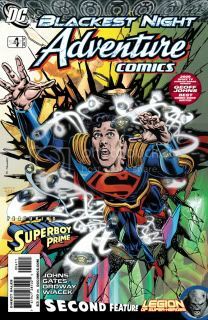 I’m aware of Superboy Prime and his role in big DC ‘Crisis’ events, but this was too much for me. Breaking the fourth wall is always risky and having a comic where the main character is constantly referring to himself as one of the most hated characters in DC is not something a new reader wants to read. Someone already a fan may enjoy this, and I did wonder on the first page how the artist knew what my basement looks like, but this issue and character are not for me. And why are there Black Lanterns on Earth-Prime? How did they get there? My brain can’t handle Blackest Night on Infinite Earths. Finally, some Marvel titles! 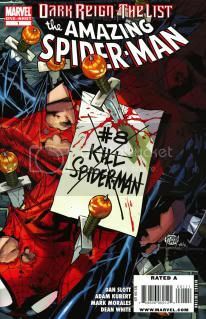 With Spider-Man being a thrice monthly title I get to give a lot of opinions on the world of everyone’s favorite wall crawler. As if you’ve been reading this column you know that I’ve really been looking forward to the Gauntlet, which starts in this issue. While enjoyed this issue it wasn’t the kick start the arc that I was hoping for. Perhaps it was the art. I don’t care for this style and I felt it lack the energy needed for this story. It was great to see Electro back with a new agenda and even more powerful but at times his message and the message of the issue, felt a bit heavy-handed. But keeping it in the real world is better than it being set on, oh I don’t know, Earth-Prime. All in all, a great set-up issue for what could become a terrific arc. Let’s start with the things I did actually like about this issue. 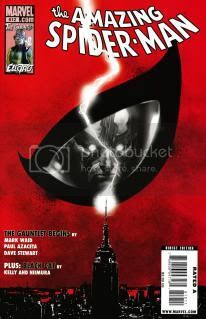 The cover and Mike Deodato’s art and that’s it. While I’m sure Bendis is using this issue to help set up the end of Dark Reign, or the beginning of The Siege, I was totally unimpressed with this story. I’m actually at a loss for words on how to describe this issue. Outside of finally getting some details about Victoria Hand this issue, at the moment, seems like a waste. 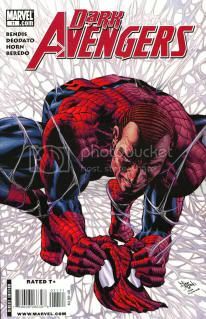 I’ve always felt that when the time comes to put Norman Osborn down, it has to be Spider-Man. Some believe Captain America should do it now that he’s (almost) back. Others believe that Iron Man must be the one to take Norman out, thus earning his redemption for allowing it to happen in the first place. But how can there be any doubt that it should be Spider-Man? While I high hopes for more from this issue I was pleasantly surprised to see Peter Parker, and not Spider-Man, be the one to knock Norman Osborn down a few pegs. 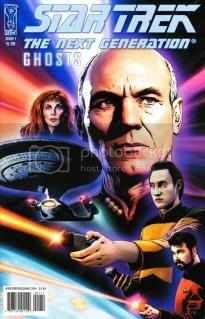 Publisher IDW has done great works of late with the Star Trek franchise, taking full advantage of the renewed interest created by the new movie. Specifically, Star Trek: Countdown and Star Trek: Nero, both of which tie-in directly with the new movie. However, their streak appears to have ended. I had high hopes as a fan of The Next Generation but terrible doesn’t begin to describe this issue. While the subtleties of Star Trek don’t always translate well to comics, this story is just plain boring. And as bad as the story is, the art is even worse. The characters look horrible and their designs don’t remain consistent. The aliens encountered on this mission have six fingers on each hand, or do they? They make mention of having six fingers but they are only drawn that way half the time, most of the panels show them with five fingers. Apparently the bridge of the Enterprise was drawn from memory after seeing half an episode, it’s never looked worse. And neither has Star Trek. Agree? Disagree? Discuss this in our forum!.